Verb tenses in English can be challenging even if you have already been studying English for many years. The tense system in your first language may be very different from English so it usually takes some time before you can really master them. Verb tenses in English are not very complicated, though, and you WILL learn to use them very well. In this series we’ll focus on the revision of verb tenses, and in later posts we will go through each tense and give you detailed explanations, and lots of examples to show how they are used. This post is a general introduction to verb tenses in English to show you the big picture before we discuss the details. So let’s jump right in! There are 12 different verb tenses in English that can be used to talk about the past, the present and the future. 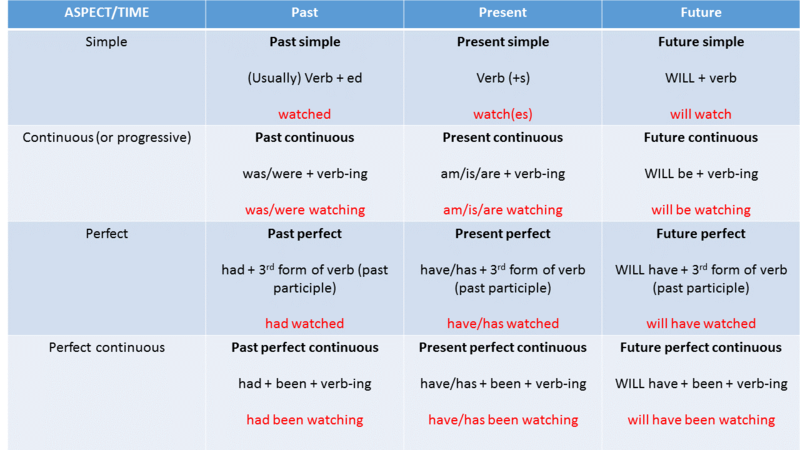 Verb tenses in English express the TIME – when something happened (in the past, in the present or in the future) -, and the ASPECT, that is how we view the actions that we are talking about. There are 4 aspects in English: simple, continuous (sometimes called: progressive), perfect, and perfect continuous. Combine TIME and ASPECT and you’ll get 3×4, that is, 12 verb tenses. What do the different ASPECTS mean? 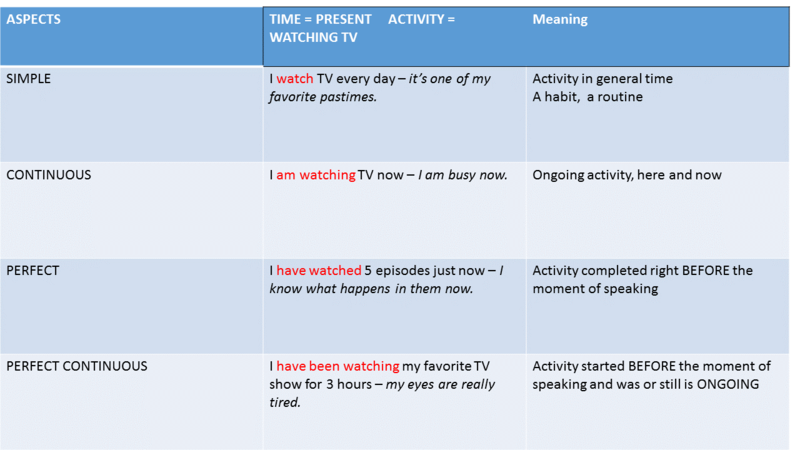 Let me give you some examples of what the different aspects mean when we talk about PRESENT-time actions. Let’s take the example of watching TV – that’s something many people do every day. the CONTINUOUS aspects helps you express that an activity is ONGOING or continuous at the moment of speaking. You don’t always watch TV, but you are doing it right now, so you are busy. the PERFECT aspect helps you talk about things that you finished BEFORE the moment of speaking. Often the result of the activity is important. For example, if you have just watched 5 episodes of the TV show, then you know what happened in all 5 of them and can tell your friend. the PERFECT CONTINUOUS aspect combines the meaning of the continuous and the perfect aspects. So it helps you talk about something that went on for some time BEFORE the moment of speaking. So if I say that I have been watching TV for a while now, I’d like to say that I was sitting and watching TV for some time BEFORE now.